Intel announced that with the introduction of its Haswell processor, the company's fastest integrated graphics will start carrying a new brand name called "Iris". Desktop users can expect up to a three-fold increase in graphic performance versus Sandy Bridge, while laptop and ultrabook users can expect a more than two-fold boost in graphics performance. The fastest implementation of Intel's new integrated graphics is the Iris Pro graphics 5200 (GT3e), this version features embedded DRAM on the chip package. The Iris graphics 5100 (GT3) lacks the eDRAM and is limited to CPUs with a TDP of 15W, while HD graphics 5000 is a GT3 implementation for CPUs with a TDP of up to 15W. 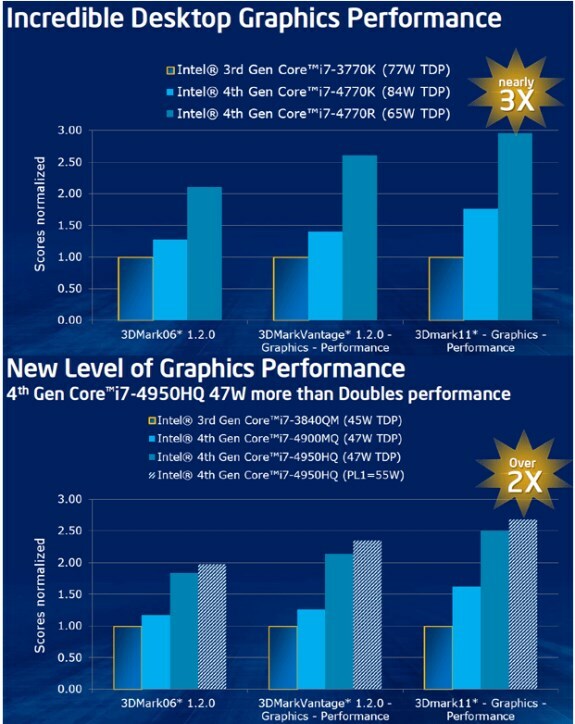 Other than that, Intel also has the GT2, which will be used for the Intel HD graphics 4600 / 4400 / 4200 and the GT1 for the Intel HD graphics. Full details can be read at The Tech Report.